NOW is the time to start taking care of YOURSELF! Start this online Be Healthy course today! Explore detoxing, strengthening and cleansing your body’s liver, blood, and digestive systems scientifically and energetically. Learn more about fasting, the phases of detoxification and more! Also includes herb and nutrient information plus 40+ recipes. Exposed to smoke, water, air, or other environmental pollutants? Having a hard time losing a few extra pounds? Feeling tired, run-down, or stressed out? Staying up too late, not sleeping, or partying too much? Waiting to go on a fast or just clean up? Catching one cold after another? Using medicines with side effects that concern you? Need to take better care of yourself? Join us for this online course, BE HEALTHY SERIES: Detox, Strengthen & Cleanse! Information on detoxing and cleansing from a scientific and energetic perspective. Common techniques used for detoxing and why they work. How the liver functions from BOTH a scientific and Traditional Chinese Medicine perspective. Information on fasting, the phases of detoxification, and how to plan your own 3-21 day detox program. Herbs and nutrients that specifically support the phases of detoxification. Information and videos about KEY herbs and foods, including Milk Thistle (Da Ji), that safely support detoxing and cleansing. Over 40+ recipes using the KEY herbs and foods discussed to help you easily rejuvenate and cleanse. Downloadable Herb Fact Sheets for each KEY food or herb discussed to keep or share with others. 100% money back guarantee within 30 days of registering if not completely satisfied. You can enjoy this Be Healthy Series session, any time, any where and go at your own pace, returning again and again to review any material or food and herb you might want to revisit. Explore detoxing, strengthening and cleansing your body’s liver, blood, and digestive systems scientifically and energetically. Explore fasting, the phases of detoxification, and more! Includes herb and nutrient information plus 40+ recipes. Join our Be Healthy Series: Detox, Strengthen & Cleanse! Join us to explore the scientific and energetic techniques of detoxing, key herbs and nutrients, foods and recipes that will help you detox, strengthen and cleanse your liver, blood, and whole body. Your purchase helps support our ongoing ability to provide you with the best information possible. Information on the liver, detoxing and cleansing from a scientific and Traditional Chinese Medical perspective. Overview of techniques used for detoxing. Printable handouts describing which specific herbs and nutrients support each particular phase of detoxification. The how’s and why’s of fasting. Information and videos about KEY herbs and foods that safely support detoxing and cleansing. Printable Herb Fact Sheets for each food or herb discussed to keep or share with others. 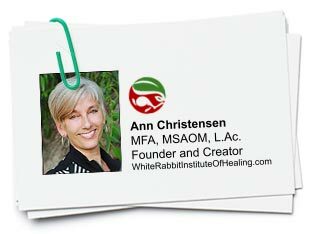 Who & What is White Rabbit Institute of Healing? How do I take this course? Our Health Series is completely online. Once you have purchased this Health Series course, you will receive an email with access information. Add us to your address book! Copy and paste info@WhiteRabbitInstituteOfHealing.com into your email address book to ensure our emails are delivered to your inbox. Your satisfaction is 100% guaranteed. If you are not completely satisfied with your purchase, email us within 30 days and we will give you a full refund. Our goal is happy members in a thriving community. When will more Health Series be available? We are continuously working on new Health Series topics. Do you have a topic you’d like us to cover? Let us know today! How long will I have access to this Health Series? If we didn’t answer all of your questions, drop us a line!